When organizations replace vital knowledge sharing dialogues with reports, emails and tweets, they lose the opportunity to draw out the context around what they know. As organizations emerge from the recession, racing to get out new products and services, it is ever more critical that they take advantage of the know-how that lives inside their experts, teams and networks. However, their current social media and knowledge-capture programs are often too diffuse to win this race. 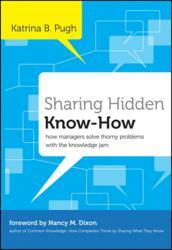 Katrina Pugh’s “Sharing Hidden Know How: How Managers Solve Thorny Problems with the Knowledge Jam” (Jossey-Bass/Wiley, April 2011) addresses this gap. The book reignites conversation as an enabler of innovation and adaptation. “Sharing Hidden Know-How” introduces the conversation-based Knowledge Jam method, which pairs experts and teams who hold organizational knowledge with the people who need to use that knowledge. Adding the disciplines of facilitation and translation to the conversation discipline, Knowledge Jam accelerates innovation and improves business practices by uncovering startling insights, and moving them into practice. Pugh shows how organizations can then maximize combined knowledge during merger integrations, smooth executive transitions and succession planning, optimize off-shoring and outsourcing, and make social media initiatives more productive. Rich with Knowledge Jam examples from industries including information technology, financial services, management consulting, universities and non-profits, “Sharing Hidden Know-How” shows how the Knowledge Jam’s three disciplines -- and the resulting culture -- have helped organizations weather transformational change. The book shows not just “how-to-do,” but “how-to-be,” providing historical context and facilitation strategies. Endorsers for “Sharing Hidden Know-How” include renowned experts in leadership, business intelligence, social media and knowledge management (KM), including David Kantor, Thomas Davenport, Larry Prusak, Suzanne Livingston and top business leaders from several Fortune 100 companies. Katrina Pugh is president of AlignConsulting, a firm that helps organizations plan business and technology change by channeling insight into action. She formerly was VP of Knowledge Management for Fidelity, Senior Technical Program manager for Intel Solution Services, and held leadership roles at JPMorganChase and PwC Consulting/IBM. A frequent facilitator and lecturer, Pugh is the co-author with Nancy Dixon of the Harvard Business Review article, "Don't Just Capture Knowledge. Put it to work!" For more information about this book, visit the Amazon or Jossey-Bass website. You can also connect with Katrina Pugh on Twitter and LinkedIn.